By the 1990s Woolworths had become one of many retailers in the Kingfisher stable. Attention was firmly on expansion into Europe, as the parent company went on a spending spree, acquiring a half-share of Castorama, which was France's equivalent of B&Q, as well as Darty, a French "Comet plus", and shop chains in Eastern Europe as their countries emerged from behind the Iron Curtain. 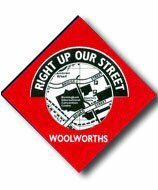 From the owners' perspective Woolworths was "sorted", and as such was left to its own devices. But no retail formula lasts for ever, particularly as new competitors emerge, and no retail management can continue indefinitely without making a mistake. 1994 brought a series of unforced errors, which brought profits tumbling, and highlighted the need to update the strategy for the High Street stores. After a sustained period of growth, in the early 1990s profits started to fall back. The shortfall was driven partly by rising costs in newly opened stores with higher rents, and partly by the capital costs to roll-out EPOS bar code scanning tills. But primarily the problem was that the trading formula was starting to look dated. The firm had used broadly the same business model for a decade. 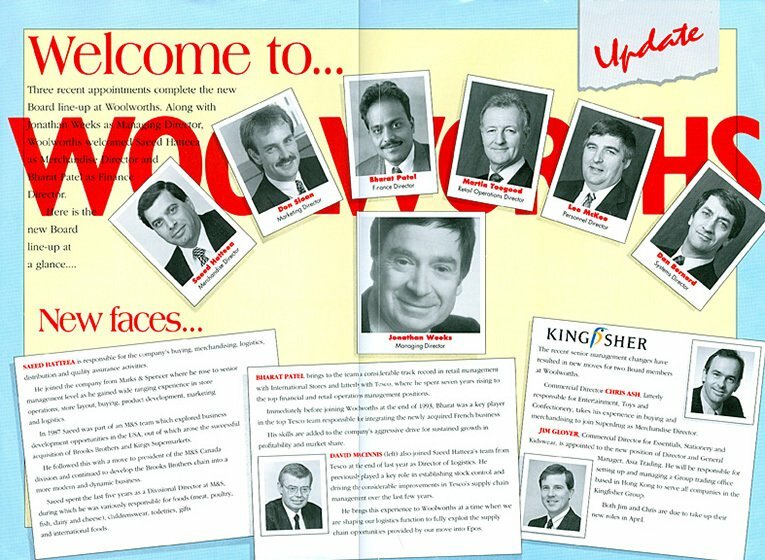 Some of the Directors had moved on to new roles within the Kingfisher Group as part of a rotational strategy. The popular and long-serving Property Director, Roger Jones, was appointed MD of the Entertainment UK wholesale division, and then to the top job at Superdrug. The two Commercial Directors also moved on. Chris Ash went to Superdrug, while Jim Glover was tasked with establishing a new Far East sourcing office, under the name Kingfisher Group Asia Limited. Meanwhile Mair Barnes, who had won a CBE and an award as Young Business Woman of the Year for doing so much to revive the brand, Finance Director Paddy Walker-Taylor and George Makulski completed their contracts and left to pursue other interests. The old team had driven Woolworths' profits to almost £80m a year, but Kingfisher hoped that changes at the top would drive new growth. Jonathan Weeks rejoined the Board as MD, after a successful spell at the helm of Entertainment UK. During the 1980s he had played a pivotal role in modernising and streamlining the Supply Chain and Distribution Operations, and had built a good knowledge of the High Street chain and its strengths and weaknesses. Kingfisher also brought in expertise from outside the Group. Saeed Hatteea from Marks and Spencer became Merchandise Director, while two Tesco Executives, Bharat Patel and David MacInnis, took charge of Finance and Logistics respectively. Don Sloan took on the Marketing Portfolio. The new executives' challenge was to update the brand and to restore the momentum of sales and profit growth. They would also have to ensure that the chain delivered the benefits of its investment in EPOS, which was being championed by two longer-serving Directors, Martin Toogood at Retail Operations and Dan Bernard at Systems. The two men had already secured more than £20m a year in benefit from the retail side of the business. Kingfisher had embraced the concept of "everyday low prices" and tasked the new executives with put it into effect.At the time retail gurus called this sort of strategy a 'virtuous circle', which would tackle consumer cynicism about so-called special offers by lowering prices throughout the year. It was marketed as 'Woolworths Street Value'. Research showed that customers struggled to understand why the initiative was marketed as 'Street Value'. The term was more commonly heard in news reports like 'Customs officers at Dover have seized drugs with a Street Value of £1 million'. The associated advertising strapline 'right up your street' provided ammunition to graffiti artists and comedians alike. A little dirt of the side of a lorry trailer made the logo appear to read "right up yours" ! Removing regular monthly 'half price', money off and extra value promotions damaged sales, leading to a fall in profits from £77.8m in 1993 to £74.5m in 1994 and a collapse to £51.4m in 1995. The steep fall was accentuated by supply problems during Christmas trading. As a result there was a further major shake-up in the Board Room. The two Directors behind the EPOS programme were promoted. Dan Bernard moved to Kingfisher as Group IT Director, while Martin Toogood took the helm at B&Q. Most of the others were despatched in the time-honoured fashion. Unlike underperforming store staff, they were paid to go away. It fell to an old friend to turn the situation around.